Macro at Hikertown. These old-town buildings are facades, the real bunkhouse is nearby. Hikertown is on the property of trail angels who live near where the PCT crosses busy Highway 138, and provided a welcome respite from the crazy winds we encountered along the final stretch of the aqueduct. Every picture we've ever seen of Hikertown has been of small outbuildings with an "old west" facade that include a post office, sheriff's office, saloon, etc. It turns out that these are just backdrops and hikers are actually put up in the "bunkhouse," a semi-converted garage that includes kitchen facilities, bathroom with shower, couches, and a piano. We didn't plan to stay overnight but did need to refill our water and knew that Happy Feet and Carbon were hanging out for the afternoon, waiting for Wrong Turn and Eastwood to show up. Bob of Hikertown welcomed us at the gate, and we thanked him for maintaining 55-gallon barrels of water along the trail (one we passed earlier in the day, and the 2nd we planned to hit tonight for dinner). He asked if we were staying over and seemed surprised that we just wanted to say hi to the other hikers and eat our lunch indoors before hiking on. He told us there was already a wind advisory, and that the winds were only predicted to worsen throughout the afternoon. When asked if it was always so windy around here he thought for a minute before answering that he couldn't remember a time where the wind had ever been so strong. Just our luck, I suppose. We found Happy Feet and Carbon on the couches in the bunkhouse, freshly showered and wearing raingear (de rigeur for hikers whose clothes are in the laundry), and all lamented about the wind as we ate our lunch. The garage doors rattled and we could hear things being tossed around outside in the gusts. After about an hour, I turned to Macro to see if we were staying or going. Our goal was another 15 miles for Day 105 and if we didn't start soon there's no way we would make it. Although the shelter and comfort of the bunkhouse was tempting, we decided to press on and walked out into the swirling dust to dart across Hwy 138 between semi-trucks and tumbleweeds. South of the highway, the trail immediately enters dry foothills covered with low brush and dry grasses. It was still windy, but we noticed right away the dampening effect of the topography and vegetation compared to the broad flat expanse along the aqueduct. We could actually hold a conversation, and only when crossing open saddles and in certain drainages did we have to brace ourselves with our hiking poles against strong gusts. We were happily surprised at this development and were glad to have made the decision to leave when we did. Signs alerted us that the trail was adjacent to hunt club property, with hunting & shooting active Oct-Apr. We didn't see anyone or hear gunshots, but also didn't run across any wildlife in this area. The dry hills were striking in shades of deep red, dark green, and yellow-brown as we made a meandering climb above the Antelope Valley, and we watched the large dust cloud move east from over the aqueduct, past the turbines of Iberdrola wind farm, and out into the Mojave. We aren't familiar with most of the desert plants so we nickname them according to similarities with plants that we do know or based on their characteristics. There is the leathery sagey basil, the dried double pom-pom, and the spiky guy with grey-green leaves. Deerbrush, yucca, and dried grasses rounded out the flora in the first several miles. While we appreciated the beauty of the flat desert section along the aqueduct, we were even happier to be back in the hills. We left the hunt club property at Oakdale Canyon, also crossing the San Andreas Fault line at this location, and entered the Angeles National Forest for the first time. Soon we came to a trailhead parking area with Bob's 2nd water barrel and were happy to find it had plenty of water. On the exposed knoll it was tricky to find a spot with sufficient protection from the wind to cook our dinner. Just as we arrived, another hiker came in from the south. We learned she is section hiking from Green Valley to Walker Pass, which will complete her multiple-year hike of the California PCT. She didn't need water and continued on, planning to stay at Hikertown tonight. Other than the guys in the bunkhouse, she was the first hiker we had seen since leaving Tehachapi. We filled up with water before heading out, even though there are a few near-trail sources (wildlife guzzlers) coming up, since potable water is so convenient. The trail climbs steeply up the slopes of Liebre Mountain, at first through oaks of every kind and then a thick and varied deciduous forest. There were many low shrubs and a few larger trees bearing something much like chestnuts, and lots of a dried vine with spiky cucumber-like fruits, along with plenty of tall but dying vegetation. It definitely felt like fall walking through so many dried leaves and plants, and it was hard to believe that just this morning we had walked through a sandstorm amidst Joshua trees in what felt like a season-less desert. After gaining ~1000' we passed a horse camp and a stand of enormous Gray pines, then started a more gradual ~700' climb along a shoulder to the ridge of Liebre Mountain. The sun dipped below the horizon as we reached the upper section and found ourselves on slopes covered in golden grasses with scattered oak trees. We enjoyed the spectacular sunset with oak trees silhouetted against fiery red and orange streaks to the west and a more muted gradient of pink to purple to deep blue over the wind farm and desert to the east. Once on the ridge, the trail contoured along near the top of the mountain working its way to the east and we hiked a few more miles by headlamp until we reached a little protected spot in some trees to pitch our tent for the night. It was surprisingly cold, and we could see our breath as we walked for the final stretch. It was nothing like the Sierra but by far the coldest night we've had since before Kennedy Meadows. It took us a surprising amount of time to warm up in the tent even in our sleeping bags, likely due to a combination of exhaustion from fighting the morning's wind and a long day of hiking, with probably a minor contribution from the actual temperature. On Day 106 we were happy to find that it was no colder than our usual SoCal morning, chilly temps sufficient to make us start hiking in a few layers but not enough to numb fingers or toes. The trail was much like yesterday evening's, through slopes of oaks and dry grasses alternating with ones covered in manzanita and other chaparral-type plants. One with red-orange blooms reminds us of the thyme in our garden at home, so we call it desert thyme. It really is strange not to know most of the plants. We contoured over to Sawmill Mountain, and along the way passed two milestones, the official 500-mile marker post, and about 1.5 miles later the "current" 500-mile trail marker, spelled out in rocks on the ground. As we mentioned at the halfway point, the definition of 500 miles depends a lot on who's counting, and how. These numbers don't take into account trail closures or detours, and in southern CA there are plenty. But still, knowing we have only 500 miles (give or take) left to hike feels pretty incredible. I remember quite vividly when we had hiked 500 miles from the Canadian border, how monumental that felt at the time, and how long ago that seems to us today. Now that's all we have left to hike in this entire journey. The sun rose over the chaparral hills and imbued everything with a golden glow. There was a light breeze, but nothing like the winds of yesterday and it was magical to be on this high ridge just 500 trail-miles (or so) from the Mexican border, with desert to the north and hills in every other direction. It seems crazy that we are in Los Angeles County, and is hard to believe that in less than a month our journey will be complete. Road walk! The Powerhouse Fire detour takes us along Pine Canyon Road. The Southern CA PCT is infamous for its trail closures and detours. Forest fires often close sections of the PCT for years at a time, and there are also long-term closures for endangered species protection and for overgrowth of Poodle Dog Bush (a plant with effects similar to poison oak). Some have official detours, and others don't. Hikers have to decide whether to hike along each official or unofficial detour, which usually involves some roadwalking, or whether to try to get a ride around the closure. Our first encounter with this issue came on Day 106 with the Powerhouse Fire closure, in effect for the past 4 years. There is no "official" detour, though there is an unofficial detour so commonly used that there is a printed Halfmile map showing the route. The 12.9 mile detour is nearly all on-road, and bypasses just over 15 miles of the closed PCT. We have heard that many NOBOs catch a ride for either the road portion or even the entire stretch between Green Valley and Hikertown, but we planned to walk the full detour like every other SOBO we know. We left the PCT at Upper Shake campground (named for its location near the fault line) following a steep, narrow use trail down Shake Canyon towards the road. This section had plenty of poison oak, the first we'd seen since northern CA, but was also filled with big-leaf maples, oak trees, and more lush plant growth than we've encountered in the past few weeks. Yellow maple leaves fluttered to the ground around us as we walked, and the sunlight filtered through the remaining leaves was pleasantly warm. Along the dry streambed, brown and dying vegetation reminded us that we are more than halfway through October and despite the warm temperatures of southern CA it is definitely fall. We came out of Shake Canyon onto Pine Canyon Road, a quiet and narrow two-lane road winding through the the hills over Bushnell Summit. Once we were out of the trees, the afternoon was quite warm and that little breeze became a real lifesaver. There wasn't much of a shoulder, and we dodged plenty of litter and weeds as we walked along the hot road, making way for the occasional passing car. We laughed as we passed a road sign that said "ICY", finding it hard to imagine anything nearing those conditions. Who's running the ostrich ranch? Quail? And why so many yard sales? Funville right this way, but Keep Out! After a few miles we started to run into signs of civilization, as it were. It would be impossible to mistakenly assume implicit permission to do anything but stay on the narrow shoulder, given the number of "No Trespassing" signs that we passed on these large but ramshackle lots. We didn't see too many dogs, though there were plenty of "Beware of Dog" warnings. There were many other animals including a smattering of goats, horses, and chickens. We passed what appeared to be a wolf sanctuary, though none were out and about in the huge barren lot surrounded by chain link fencing. A run-down ostrich farm's gate was closed and locked and a schizophrenic collection of signs proclaimed "Guests Welcome", "Keep Out", "Tours and Feeding $5/person", "Must Stay Back 6' Security Camera Enforced", and perhaps most strangely, "Yard Sale Every Weekend". The market for ostrich meat and eggs must be weak. The ostriches themselves seemed bored, and ran back & forth as we walked past. Residential-type properties had yards filled with rusting iron, random small structures, and overgrown weeds. We hadn't seen a single person for miles outside of the occasional car, so we were surprised to see a guy with unruly grey hair come out of nowhere, crossing the road directly at us while carrying what appeared to be a long golf club wrapped in newspaper and masking tape. He sounded slightly unstable as he greeted us with "don't worry, they'll rush you but won't do anything." It took me a minute to notice he was also carrying dog leashes and then looked out into the open space across the road to see 3 dogs racing towards us. As advertised, they were friendly. Kenny was clearly eccentric, but a nice guy who asked us to hold a PCT symbol and interviewed us "for an art project" while recording video on his phone. We never found out about the golf club. Continuing along the road we passed a house where a wooden sign painted "FUNVILLE" in bright colors pointed up the driveway, just beyond a fence posted "Keep Out". Nearing town, we walked past two pomegranate trees laden with fruit, many cracked open and others fallen on the ground. We were so tempted to pick a few from this unfenced property overgrown with grasses and weeds. I noted that on the garage door was painted "Welcome" in large letters, the warmest signage we've seen on this entire roadwalk. But after conferring, we decided that the trees were clearly on the property (rather than hanging over a fence) and the garage wasn't painted "please pick our pomegranates," so we resisted the urge. We passed a large depression of cracked earth surrounded by willows and enclosed by a dilapidated chain-link fence plastered with "Keep Out" signs that apparently used to be one of the lakes for which the community is named. Not long after that we entered the town of Lake Hughes, a strange mix of empty lots filled with trash and tumbleweeds, new construction of concrete-block or stucco two-stories, and low ranch houses circa 1950. Many were for sale. We stopped into the "country store" and although we were told on entry that we had to buy anything we broke (?!) the older guy working there did let us refill our water. We learned from the teenager behind the register that both Hughes and Elizabeth Lakes had been dry for the past year or two on account of the drought. It struck us as depressing and poignant both to see the community, likely once a great place to visit and/or live, apparently drying up along with its lakes. On Kim's patio with clean legs from her hose! The second half of the roadwalk couldn't boast many strange distractions, and had no real redeeming qualities. The day had gotten quite hot and the road had more traffic. Cars whizzed by as we walked along the narrow, litter-strewn shoulder past the cracked earth of Elizabeth Lake and an abandoned golf course whose fairways were dry and brown. The houses on the hills around us were newer and looked better maintained than those of Lake Hughes, and judging by the amount of traffic it seemed that this end of town remained an active commuter community at least. We turned onto San Francisquito Road for the final few miles and found ourselves essentially walking along a busy highway with limited sight lines and no shoulder to speak of. The houses were hidden behind fences and gates, with a few horse properties interspersed in between. Just beyond a sign advertising fresh eggs, a woman tending to a horse called out through the fence to us, offering water. We had planned to stop at the fire station in Green Valley (the last water until Agua Dulce) to fill up and also cook dinner, but that was 0.25mi beyond where we would otherwise rejoin the trail from the detour. Kim offered that we could hang out on the shady patio by her barn and cook there. It was perfect. Not only did we avoid 0.5 bonus miles, but we also had dinner on comfortable deck chairs with shade, electrical outlets (for charging devices), and a bathroom with a sink and flushing toilet - far better than a spigot in the fire station parking lot. Kim even brought us out a couple of ice-cold Mountain Dews, and though we don't often drink soda they didn't last long and tasted delicious. We learned that she is a fellow trail/ultra-runner, and also does both equine and mountain biking endurance events. We exchanged stories of running, trails, and hiking. Living along the detour road she sees tons of NOBOs in the spring and often sets out coolers filled with soda for hikers during their peak, but she was less familiar with the SOBO option and was interested to hear about our experience. It was a real treat to eat and regroup at her place before wrapping up our road walk, and fun to have the serendipity of meeting someone with so many shared interests. We decided that Kim was our ultra-trail angel. The last mile or so of the road walk passed quickly after we left Kim's place, though at 5pm on a weekday there were so many cars going so fast that it felt like walking on a freeway. Turning onto the trail we both breathed sighs of relief. We hiked another few hours, enjoying evening light on the chaparral hills then donning headlamps for the final few miles. We passed one northbound section hiker setting up camp in the dark, the only person we saw on-trail today. The cool evening breeze was a welcome relief from the day's heat and once it became dark the light of the moon and stars on the pale earth of the trail and hillsides gave us a sense of our surroundings. It was one of the most pleasant night hikes we've had so far on our journey, and if it hadn't been for my pesky feet I could have hiked all night. Instead, we found a protected spot under some low trees and set up our tent just after 8:30pm. Day 107 was clear and warm, and we continued our contouring walk around the chaparral-covered ridges with its deep reds, dark greens, and pale earth. Although there were giant power lines crossing the hills with a dammed reservoir far below, and we could see scattered buildings in the distance, we had the trail to ourselves and it felt a bit wild up high where we walked. We dropped down to cross Bouquet Canyon Road then started a long though civilized climb to our high point for the day. We were happy for shade on the first section, and a steady breeze as we got higher. Cresting the final ridge, we could see south to the green Sierra Pelona valley holding Agua Dulce. The landscape between us and that valley was all shades of yellow and brown, a marked contrast to the opposite side of the hill. The temperature increased dramatically on these south-facing slopes, though we walked into a strong and gusty wind that made it difficult to walk but did moderate the heat. I nearly stepped on a large snake resting halfway into the trail and backed up quickly into Macro, who took a few pictures before nudging the guy back into the surrounding dry grass with a few rocks thrown nearby and some clicking of his hiking poles. It wasn't a rattler but we didn't know what kind of snake it was and didn't want to take any chances. We found a teeny spot of shade from the embankment of the trail itself around a corner, and sat right on the ground in the narrow trail to have our lunch. From there, we made good time for the last several miles into Agua Dulce with a goal of getting out of the heat and wind. As we neared the signs of civilization but were still ~2.5 miles from Agua Dulce, we realized that "the trail goes right through town" is a euphemism for "you will be walking on the road for several miles". Fortunately, there was a wide dirt shoulder and not much traffic. Agua Dulce couldn't be more different than other towns the trail has passed right through. Its large lots are immaculately landscaped and maintained behind neat white fencing, and most properties had horses with very nice facilities of their own. The houses are set back from the main road, on side roads that are nearly all marked Private. We weren't sure what to expect from Hiker Heaven, AKA the Saufley's place. 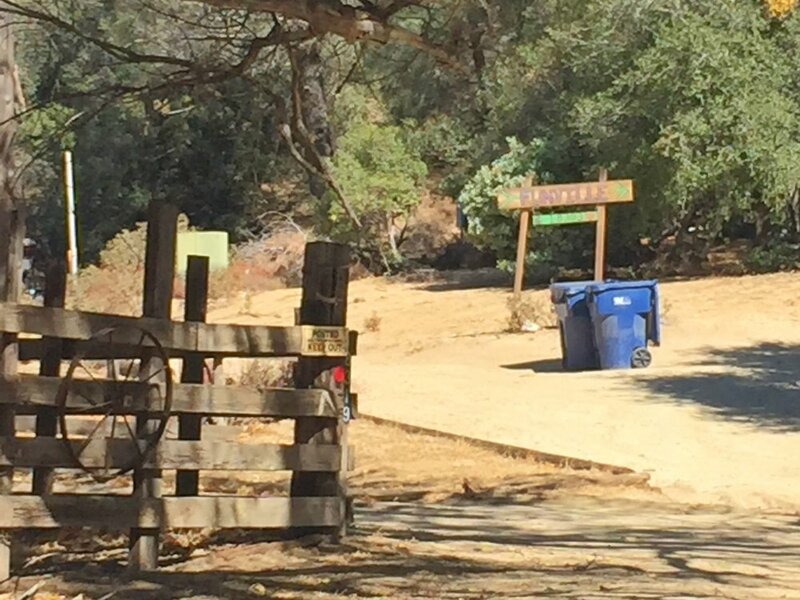 It seemed unlikely that residents of such an orderly community would host thousands of dirty hikers over the course of several weeks in the spring NOBO season. And yet, Jeff and Donna Saufley are legendary trail angels who have opened their home here to thru-hikers for nearly 20 years. We turned up their (public) road from the small downtown and walked the final bonus mile to their address, wondering what we'd find when we arrived. The only outside evidence that their home was a hiker mecca was a PCT sticker on the trash bin and another on their back gate. Through the gate we found another immaculately maintained yard with a chicken coop, a few horses, friendly dogs, shady pergolas, large cactus gardens, and a meandering gully lined with round river rocks. Along the far fence was a tidy mobile home, and there were two RVs parked in lower corners of the lot. As we were deciding whether to knock at the main house or head to the mobile home, Country Gold came out of the latter. He is a volunteer who has been at the Saufley's since May to help with the hikers, and oriented us to the place. The garage was filled with orderly bins of donated gear, loaner clothes, hiker box food, and mailing supplies. We would stay in a bedroom of the mobile home "reserved for girls or couples" and once we chose loaner clothes we should put our own clothes in baskets provided so Country Gold could do our laundry. The bathroom was stocked with toiletries of all types and clean fluffy towels. Any labeled food in the kitchen belonged to somebody, but everything else was fair game. Our resupply box and packages from friends were waiting for us. The WiFi was fast. The only rules were "no walking around naked, and no catholes on the property - use a bathroom". We could see why this place is called Hiker Heaven, though we still found it hard to imagine a typical day in NOBO season, with 50 (or more) hikers on-site. We put $40 in the donation jar to thank the Saufleys for their generosity and settled in. Wrong Turn was already there, having hitched from Lake Hughes yesterday due to knee pain. Happy Feet, Carbon, and Eastwood came in a few hours behind us and we joked about the "supercell" of SOBOs - 6 of us in one place for the night is almost unheard of. We all walked downtown for dinner at the bar/grill, and had great fun catching up over a meal. Just south of Agua Dulce is the Sand Fire closure, which affects ~25 miles of trail, and we all debated how to best would manage this stretch. There is neither an official or published unofficial detour for this closure. Some hikers walk the main highway/road from one end of the closure to the other. Fellow SOBO and SoCal native Grateful Red recently posted on social media an alternate road walk that is a bit shorter in distance and utilizes more local & back roads, and some hikers have been taking that route. Country Gold told us that most hikers this season have gotten a ride around the closure, and a local trail angel who lives in Acton has offered to be available to drive us. For Macro and I, it was an easy decision since the second half of the Powerhouse roadwalk completely cured us of any desire to walk on the shoulder of busy highways in the desert heat. I can't think of anything worse than 25+ miles of this. If the trail were open, we would walk it. But the trail is closed without any official alternate, and we are perfectly happy to ride with Mary to the other end of the closure. I called her and we made arrangements to be picked up at the Saufley's tomorrow morning. The guys will probably spend another night at Hiker Heaven to let some other friends catch up before continuing south, and are still undecided on how to navigate the closure. We hope to cross paths again, though as we get ever closer to Mexico the time for running into friends down the trail grows shorter. Nobody says it, but we all know that when we say our goodbyes in the morning it may be the last time that we see each other on-trail.